The number one issue with aquariums in high risk clinical environments is infection control! An aquarium situated in a healthcare interior like a clinic, surgery or care home not only creates a dynamic and visually appealing feature, but is an effective tool for reducing anxiety, improving recovery and overall wellbeing. These remarkable benefits are often overshadowed by the potential health risk posed by the standard design aquarium system in clinical settings. Aquariums can quite easily become hubs for communal cross infection as people (children in particular) will have a tendency to touch the display, leaving behind bacteria and viruses on the surface of the glass and surrounding cabinetry. The other source of potential infection is the water itself, with waterborne bacteria potentially creating further complications with recovering patients. Managing hygiene and cross contamination between patients, staff and members of the public is a major challenge faced by healthcare facilities. Hygiene is a big topic within this sector and the media, with recent outbreaks of so called super bugs causing epidemics on local and national levels. There are serious financial implications connected to poor hygiene for healthcare organisations. Consequences in the event of an outbreak can vary from more money been spent on resources for cleaning and treatments, to a chronic loss of revenue from closures of departments and buildings. This can be a real issue for private organisations that rely on reputation and trust to ensure future sales and consistent revenue. The design of healthcare spaces has recently become a very specific niche within architectural and interior design. For a designer, creating beautiful healthcare spaces presents a difficult challenge as the usual materials and surfaces that most designers like to work with (i.e. wood, stone and fabrics) are unsuitable for the healthcare environment. These materials contain pores that allow pathogens to hide and multiply, making these surfaces difficult to keep hygienically clean. Non-porous surfaces like plastic, glass, corian and metals are typically used in these environments as they are easy to clean, however if not applied correctly these surfaces can create a very clinical feel to the environment. Recent innovations in this sector have led to the development of antimicrobial surfaces. These surfaces are made up of materials that contain properties which disrupt the molecular structures of bacteria and viruses causing them to die on contact. Laminate the aquarium outer surface with antimicrobial glass such as the one developed by AGC. The support frame that bears the weight of an aquarium is usually made of wood, powder coated steel, or anodized aluminium. By using a copper plated aluminium frame you can prevent bacteria and fungus growing on those hard to reach surfaces. For cabinetry doors and panelling use corian or acyrllic. They are not anti-microbial but are strong, non-porous materials that are easy to clean and come in a wide range of colours. Alternatively use anti-microbial Copper or copper alloys (some copper alloys look like stainless steel) for doors and panelling. Significantly reduce the threat of waterborne bacteria and viruses by incorporating UV sterilisers into the aquarium circulation system. UV sterilisers continuously kill microorganisms by damaging the DNA. Ventilate the aquarium via extraction and ducting to remove moist air within the cabinetry preventing the proliferation fungus and the spread of spores. Creating attractive spaces that are safe and suitable for the application intended is the challenge faced by every designer working with healthcare environments. By specifying interesting features that are made out of the right material a designer can transform a dull, emotionless clinical space into a visceral experience that encourages good wellbeing and a positive state of mind. The use of antimicrobial materials will increase the material cost of a project budget. However this initial investment pales in comparison to the costs associated with an outbreak. 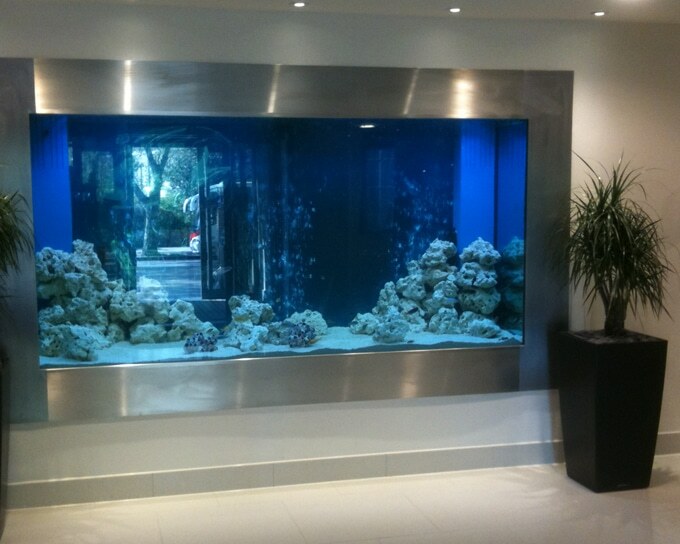 Incorporating the right materials into the construction of a healthcare aquarium allows a designer to gain all the visual benefits an aquarium adds to a space whilst minimising the potential risks to patients and the public.